The Fantastic Frogs continue to "hop" their way through the Reading Mastery Program! 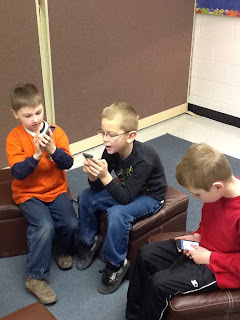 One of their favorite activities is to read words on the ipods. Each time a story is read, Mrs. Kara Myers charts the words they had difficulties with. These words are then put on a flashcard app on each individual ipod for each "frog" to read. "Frogs" pictured are (left to right) Josh Meyer, Tyler Due, and Trenton Vossler.